Replacement fence panels fitted in a Penwortham garden following storm damageKSW Services offer fencing services, including replacement and new fence panel fitting. We believe in a quality service and installing solutions that will last. We always recommend treatment, even on new panels, to ensure their longevity. As part of our Painting and Decorating and Joinery Services, we can also fit, paint, treat, repair or even build bespoke wooden gates. Looking for a large number of fence panels for a pub garden, outdoor seating or play area, nursery or other commerical premises? Please give us a call for a competitive price. We can fit, replace or create bespoke fencing to enhance the exterior view of your business. For your peace of mind, we're fully insured with public liability and professional indemnity. If required, we can provide our Fence Panels services as part of a full property refurbishment, whether it be for a rental property, preparing a house for sale or following a bereavement. 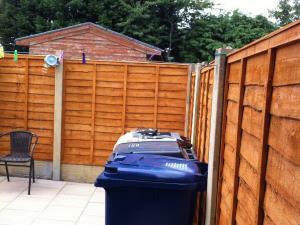 For examples of our Fence Panels work, please take a look at our Photo Gallery page. Based in Penwortham, we offer Fence Panels services throughout the Preston area including Penwortham, Leyland, Chorley, Blackburn, Garstang, Bamber Bridge, Fulwood, Walton-le-Dale, Lea, Ingol, Ashton-on-Ribble, Longridge and Lostock Hall.